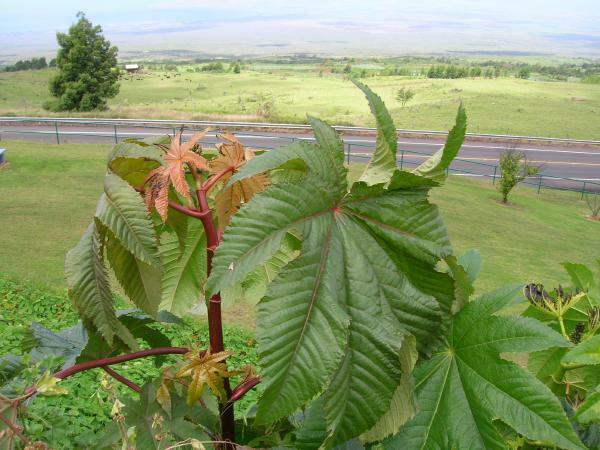 Ricinus communis is a perennial shrub that can assume tree-like status if it establishes in a suitable climate. It is frequently found invading riparian areas where it displaces native vegetation. The seed of this species is toxic to variety of species including humans. Consuming only a few seeds can be fatal. R. communis is a robust perennial shrub that typically reaches heights of 3-5 metres. It has large, palmately lobed leaves and sharply toothed leaf margins. The large (10 to 75cm across), umbrella-like leaves have 5 to 9 pointed, fingerlike lobes. Long purple leaf-stems are attached near the centers of the leaf blades. The leaves are usually deep green, but in some strains they have a reddish cast. They have an odor when crushed. The stems are smooth, round, and frequently red, with clear sap. The flowers are small and greenish, with both male and female flowers on the same plant. The fruit is a quarter-sized, three-lobed, round, spiny capsule, often green or red, containing up to three shiny, smooth, mottled seeds that resemble ticks. One large, mottled, attractive seed develops in each lobe. The flowers are male and female on the same plant, and are produced on a clustered, oblong, terminal spike. The male flowers are placed on the under portion of the spike; they have no corolla, only a green calyx, deeply cut into three to five segments, enclosing numerous, much branched, yellow stamens. The female flowers occupy the upper part of the spike and have likewise no corolla. The three narrow segments of the calyx are, however, of a reddish colour and the ovary in their centre is crowned by deeply divided, carmine-red threads (styles). 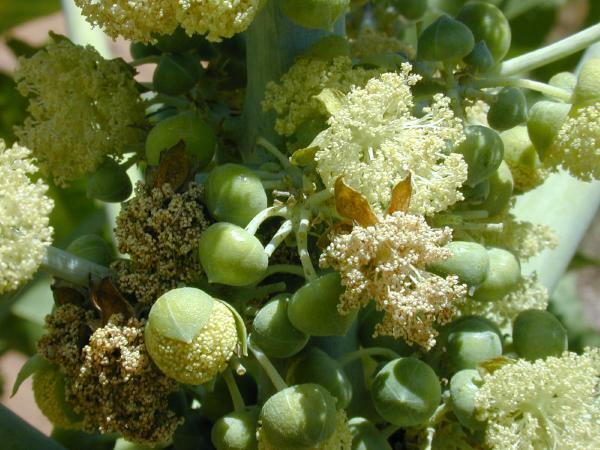 The fruit is a blunt, greenish, deeply grooved capsule less than 2.5cm long, covered with soft, yielding prickles in each of which a seed is developed (Cal-IPC, UNDATED; Dove Biotech, UNDATED). R. communis is herbaceous when young but in frost-free areas it can be an evergreen tree that gets up to 12m in height and become woody with age. The wood is soft and light with a thick central pith. Occasionally, irregular brown heartwood develops. The bark is light brown, smooth, and exhibits rings at the nodes and raised lenticels. There are a moderate number of large, star-shaped leaves with 7 to 9 long pointed lobes (Flordiata, 2005; and Francis, UNDATED). Ricin is a glycoprotein derived from the beans of R. communis and is one of the most potent and easily produced plant toxins known. Intact beans can pass through the digestive system with little or no toxic effects. The oil extracted from the seeds is used as additives in paints and varnishes and as the raw material from which sebacic acid is produced. From World War I until the 1960s oil extracted from R. communis beans was utilized as a lubricant (castor oil) for aircraft, but the United States also began developing biological warfare agents, ricin was produced because of its ease of production and toxic potency. By World War II the United States, collaborating with the British, had developed and tested, but never implemented in combat, a ricin-containing bomb code-named ''compound W''. Suspected domestic terrorists have been discovered with quantities of ricin that could pose a threat to public safety. The 1978 assassination of the Bulgarian defector Georgi Markov publicized ricin as a homicidal agent. A weapon disguised as an umbrella injected a small metal pellet thought to contain ricin into Markov's thigh. R. communis has medicinal uses as a laxative (Doan, 2004). Castor oil has other uses. The oil acts as a barrier agent to protect against harsh climate, and is soothing to the skin. Castor oil forms a clean, light-coloured, transparent soap, which dries and hardens well and is free from odour. Ricinoleic acid and its many derivatives have skin smoothing and moisturizing qualities, and improve various skin conditions such as rough skin and acne. Hydrogenated castor oil and/or its esters, are useful as vehicles or carriers, emollients or solubilizers for toiletry, cosmetic, hair and skin care formulations, and are useful for cleansing and conditioning the skin (Aburjai and Natsheh, 2003). R. communis is frequently found in riparian areas, especially along the south and central coast, where it invades and displaces native vegetation. This plant is also common as an escape in abandoned fields, drainages, ditches, and along roadsides and railroad tracks. It is killed by low temperatures, and as little as twenty-four hours at 2 degrees F is sufficient to produce visible impacts on cellular membranes of seedlings at any stage of germination. Distribution is limited by castor bean's intolerance of cold temperatures. It is tolerant of a wide range of soil types and conditions. Plants tend to germinate more profusely in full sun. Disturbance required if natural stands of R. communis are to successfully establish. If disturbance is not repeated, R. communis will be succeeded in a few years by grass, vines, or trees. It is competitive and most frequently seen in flood zones, on neglected farmland, and roadsides (Cal-IPC, UNDATED; Francis, UNDATED). R. communis reproduces by seed. Plants become reproductive in the first season (within six months) and are capable of flowering year round in a frost-free environment. A single large plant 10.2 feet (8 m) diameter was found to produce 150,000 seeds, while a smaller plant thirty-nine inches (1 m) diameter produced only 1,500 seeds (Cal-IPC, UNDATED). This plant has been cultivated as an oil crop (Whitson 1992) and as an ornamental (Hogan 1992) (Cal-IPC, UNDATED). 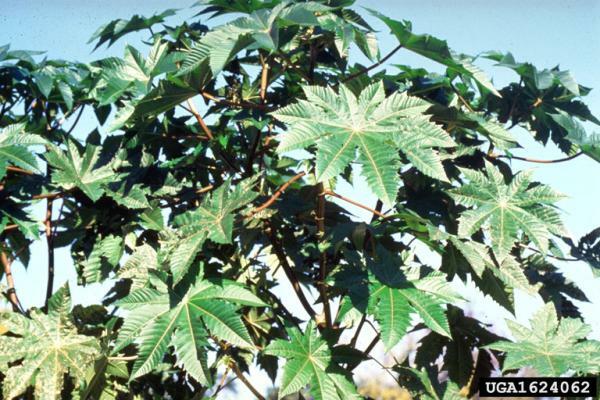 Recommended citation: Global Invasive Species Database (2019) Species profile: Ricinus communis. Downloaded from http://www.iucngisd.org/gisd/species.php?sc=1000 on 22-04-2019. 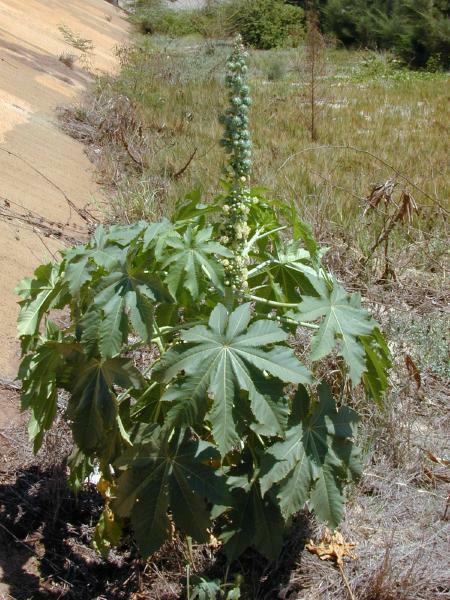 Castor bean displaces native plant species in riparian areas and drainages. Its seeds are among the first to germinate following fire. Plants colonize disturbed areas, and they grow rapidly, shading out native seeds and seedlings and producing monospecific stands in areas with previously healthy native vegetation. Humans and horses are especially vulnerable to R. communis seeds if they are chewed on when ingested. Fatal doses are from 2.5 to 6 seeds for humans and about 6 seeds for horses (CISR 1972). Symptoms are stomach irritation, diarrhea, abdominal pain, increased heart rate, profuse sweating, collapse, and convulsions. Broken seeds can cause skin irritation. The foliage is only slightly toxic. Seeds that are ingested but not chewed will likely pass through the body harmlessly (Cal-IPC, UNDATED; and Francis, UNDATED). When R. communis becomes weedy in neglected cropland and pasture it is matter of controling the invasive through cultivation and mowing (Francis, UNDATED), but in more difficult or sensitive environments Tunison and Zimmer (UNDATED) suggest cutting the stump of mature R. communis and applying the herbicide \"Banvel\" along with the mechanical control techniques of uprooting seedling. The authors report that Banvel was nearly 100% effective. Langeland and Stocker (UNDATED) also suggest treating R. communis with either basal bark or cut-stump methods followed by an application with 10% Garlon 4, but the authors reiterate that the site must be revisited several times after the initial herbicide treatment to hand pull seedlings that sprout. Informations on Ricinus communis has been recorded for the following locations. Click on the name for additional informations. Francis, J. K. UNDATED. R. communis L. castor bean. Research Forester, U.S. Department of Agriculture, Forest Service. Langeland, K. A., and R. K. Stocker. UNDATED. Control of Non-native Plants in Natural Areas of Florida. University of Florida Extension Institute of Food and Agricultural Sciences: SP 242. Tunison, J. T., and N. G. Zimmer. UNDATED.Success in Controlling Localized Alien Plants in Hawaii Vokanoes National Park. Aburjai, T., and F. M. Natsheh. 2003. Plants Used in Cosmetics. Phytother. Res. 17, 987-1000 (2003). Cal-IPC (California Invasive Plant Council). UNDATED. Ricinus communis . Devender, T. R., R. S. Felger, and A. Burquez. 1997. Exotic Plants in the Sonoran Desert Region, Arizona and Sonora. California Exotic Pest Plant Council 1997 Symposium Proceedings. Doan, L. G. 2004. Ricin: Mechanism of Toxicity, Clinical Manifestations, and Vaccine Development. A Review. Journal of Toxicology: CLINICAL TOXICOLOGY 42(2):201-208. Dove Biotech. UNDATED.Castor Bean (Rincinus communis) an International Botanical Answer to Biodiesel Production and Renewable Energy. SATHORN, BANGKOK 10120, THAILAND. Esler, A. E., and S. J. Astridge. 1987. The naturalisation of plants in urban Auckland, New Zealand - 2. Records of introduction and naturalisation. New Zealand Journal of Botany, 1987, Vol. 25: 523-537. Florence J., Chevillotte H., Ollier C. & Meyer J.-Y. 2007. Ricinus communis Base de donn�es botaniques Nadeaud de l Herbier de la Polyn�sie fran�aise (PAP). ISB-AFVP (Institute for Systematic Botany - Atlas of Florida Vascular Plants). 2005. Ricinus communis. USF: University of Southern Florida. Kogan, M., and J. D. Lattin. 1993.Insect conservation and pest management. Biodiversity and Conservation 2,242-257 (1993). PIER (Pacific Island Ecosystems at Risk). 2005. Ricinus communis L., Euphorbiaceae. Robertson, M. P., M. H. Villet, and A. R. Palmer. 2004. A fuzzy classification technique for predicting species distributions: applications using invasive alien plants and indigenous insects . Diversity and Distributions, (Diversity Distrib.) (2004) 10 , 461-474. Space, J. C., and M. Falanruw. 1999. Observations on invasive plant species in Micronesia Prepared for the meeting of the Pacific Islands Committee, Council of Western State Foresters, Majuro, Republic of the Marshall Islands, February 22-26, 1999. USDA-GRIN (Germplasm Resources Information Network). 2005. Ricinus communis. National Genetic Resources Program [Online Database] National Germplasm Resources Laboratory, Beltsville, Maryland. USDA-NRCS (Natural Resource Conservation Service). 2005. Ricinus communis. The PLANTS Database Version 3.5 [Online Database] National Plant Data Center, Baton Rouge, LA.